Last weekend, the Cabrillo College Samper Hall hosted a dazzling performance by Brass Over Bridges, a brass instrument quintet featuring musicians from the Santa Cruz Symphony. The Spotlight on the Symphony recital celebrated some of the Bay Area’s most talented brass musicians performing a selection of work by composers who have influenced American classical sounds. 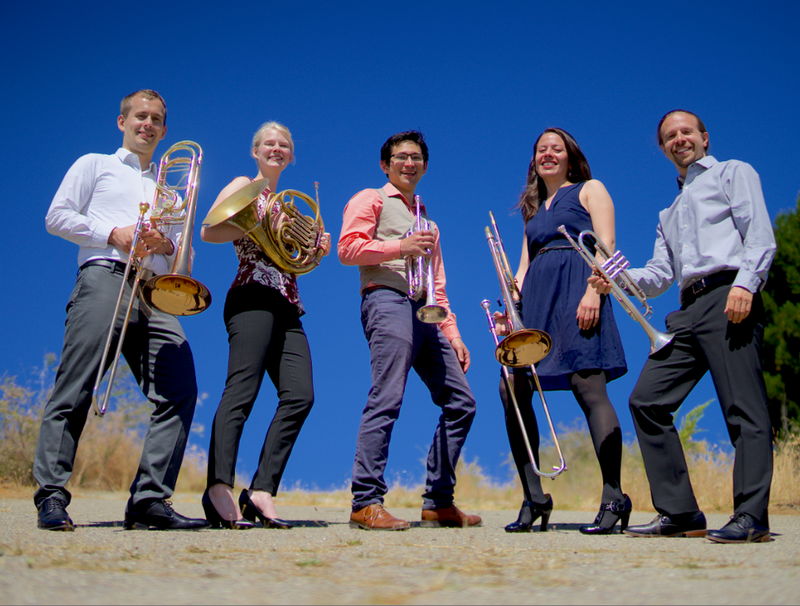 Brass Over Bridges is comprised of five excellent brass musicians: Matt Ebisuzaki, trumpet, Esther Armendariz, trombone, Margarite Waddell, horn, Ari Micich, trumpet and Lucas Jensen, trombone. Ebisuzaki and Armendariz are two of the Santa Cruz Symphony’s principal players. The other members – Waddell, Micich, and Jensen, have also performed with SCS. All of them perform and educate; bringing vast experience, commitment to musical outreach, and impressive skills to stages and schools throughout the San Francisco Bay Area and beyond. To hear Brass Over Bridges live is a revelation. Their recent program featured musical luminaries representing wide musical and ethnic diversity. Through each of their artistic contributions, the 5-part ensemble helped us appreciate these composers who define and continue to develop music, and brought attention to the dynamics and depth of expression unique to brass instrument players. Whether transmitting the dramatic lyricism of composer Aaron Copland, the intricate mayhem of “Street Song” by SF Symphony conductor Michael Tilson Thomas, or Anthony DiLorenzo’s cinematic “Fire Dance”, the musicians performed each piece with admirable ease and meticulous craftsmanship. The SCS Spotlight series is a rare opportunity to experience professional musicians in a more up-close-and-personal context. Each musician spoke in turn between each set, sharing musical fun-facts about the brass arrangements in a friendly, knowledgeable tone. Most impressive was the fact that several pieces played were originally written for other instruments – piano for George Gershwin’s “Three Preludes”; strings (and for a quartet nonetheless) for Samuel Barber’s melodic “Adagio for Strings”. Their smooth delivery of both chamber music and more unusual adaptations revealed the many colorful sounds and styles of brass instruments as well as their versatility as musicians. Despite the challenging amount of stamina and oxygen it must take to convey the powerful voices of brass, their poise remained impressively steady throughout the program right through the energetic finale. In addition to the more classical chamber arrangements, their repertoire included dance-inspiring music not often played in the symphonic setting, including Eubie Blake and Lucky Roberts peppy “Glad Rags”, and the folksy-jazzy rhythms of South American Enrique Crespo and Cuban composer Paquito D’Rivera. Throughout it all the quintet worked together patiently and harmoniously, always showing a great sense of respect and support for each other. As a collaborative group they demonstrated impeccable synchronicity, communicating with subtle eye contact to navigate each transition and intuiting moments that called for collective unison. Their much-deserved encore was full of upbeat pizzazz that had us all grinning from ear to ear. The five charming members of Brass Over Bridges stand out as much for their artistic brilliance as for their contagious enjoyment of the live music experience.